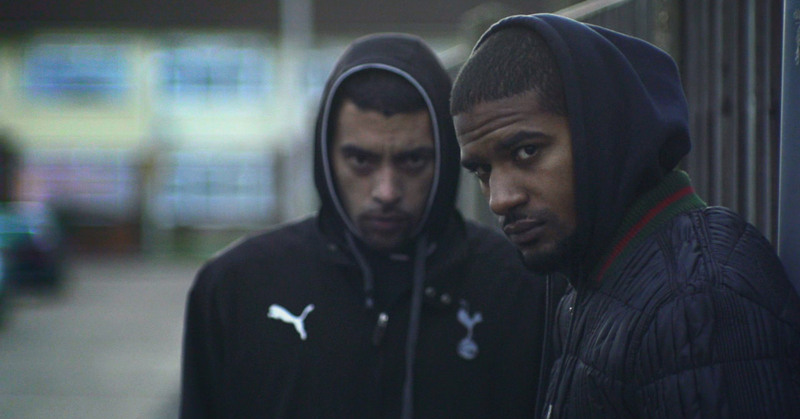 The Hard Stop is a fascinating and eye-opening documentary following two childhood friends of Mark Duggan, the man from the Broadwater Farm estate whose death at the hands of armed police officers in 2011 led to the London riots later that month. A “hard stop” is the name of a police technique used to gain the element of surprise – usually pulling out with no warning of police identity in front of a suspected vehicle, forcing it to come to a halt. A hard stop was the technique employed by the armed police attempting to arrest Mark Duggan, who died after being shot. As inadvertent instigators of the London riots of August 2011 Marcus Knox-Hooke and Kurtis Henville were protesting the death of their friend – how much of the maelstrom which followed bore their direct responsibility is not something the documentary is concerned with. What it is concerned with is the way life continues after such a huge event. Marcus led the Tottenham police station protest and was later imprisoned for violence, whereas Kurtis escaped prosecution. This is a film about the human factor, a humane and ultimately non-judgemental look at the lives of the two men post riot and how they moved forward. Kurtis is delightfully earnest, a funny guy broken by circumstances. Now working in telesales in East Anglia, his stoic stance is both admirable and underlined by an unspoken sadness as he attempts to make the best of his circumstances. As an audience he is easy to cheer on, because his demeanour is so charming. Marcus still is presented as still having a great deal of anger simmering as he moves forward out of prison. It makes him appear more wounded, and ultimately more damaged. The unsatisfactory results of the enquiry into their friend’s death are present under their skin. The film shows life away from the headlines, away from the news. Director George Amponsah had two and a half years on the estate giving voice to the still simmering anger over Duggan’s death. The riots can be seen as a roar of frustration – an impotent fury that wasn’t quashed. That the baton of rage was passed around the entire city and then around the country is something which the film doesn’t address, which is a shame. Although there were clear personal reasons for the start of the riot, the literal inferno which resulted had a wider socio-economic cause which aren’t gone into. This is a specific documentary about the riots, a story of how people are unexpectedly broken. It is in many ways heartbreaking – it would just have been nice for things in the wider context to have been presented too. How unique was the experience of Marcus and Kurtis? What we are left with is the feeling that the death of Mark Duggan has so damaged the community, that the scar it has left may never fully heal. The Hard Stop is out in cinemas now.